OK, I am dreaming. It has been hot and steamy in Boston, and it was even hotter and steamier in Florida on my parental check-in visit last week. 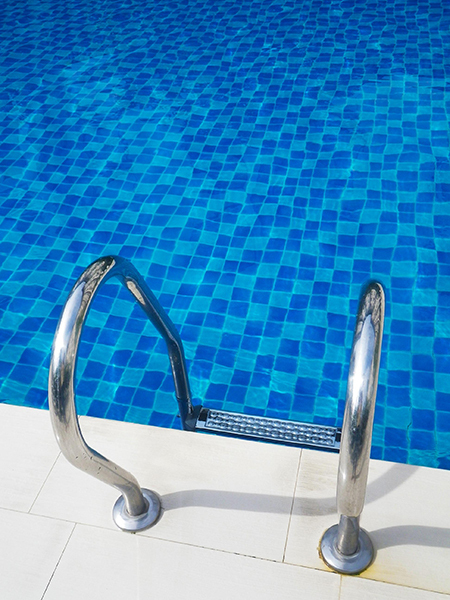 I am dying to jump into a giant cool pool. But instead, I find myself reflecting…on the year behind and the year ahead…over the EPR landscape in the U.S.
As an organization, PSI has hit its stride. As we approach our 15th year, we are moving from adolescence and the Constant Present to implementing our fourth long-range plan for the future. We have a solid new board of directors that includes a balance of geography (East, West, Midwest, South), politics (red, blue, and purple), and skill sets – all 100 percent committed to advancing product stewardship programs across the U.S.
We have an equally committed staff of 9 dynamic individuals, supported by over a dozen interns and consultants, who juggle multiple projects, fundraise, promote our accomplishments, and assist in passing and implementing product stewardship laws and programs on about 20 product categories! PSI’s membership and partnership programs have steadily increased from 150 in fiscal year 2009 to over 400 today, representing an active, vibrant, and expansive product stewardship professional network of individuals from agencies, businesses, organizations, universities, and non-U.S. governments. PSI’s finances have also improved slowly but steadily over the past 14 years, and this past year was the first time we broke through the million dollar revenue mark. Our funding strategy has always been to diversify, and we have been successful in maintaining a balanced portfolio of memberships, partnerships, private and public consulting, foundation funding, and other revenue. Vermont passed the nation’s first primary battery law. Colorado passed its first product stewardship law (the eighth paint law in the nation). Two major household battery industries representing single-use and rechargeable markets jointly developed draft legislation, preparing for the introduction of bills in several states in 2015. There has been acknowledgment by carpet manufacturers that they have a responsibility nationally to fund the recycling of their post-consumer scrap carpet. And, as our colleague Matt Prindiville of Upsteam pointed out on our recent Annual Membership/Partnership Conference Call, the consumer packaged goods companies have also acknowledged their responsibility to recycle their packaging. Moreover, several additional EPR laws have a chance of passing by the end of the year. PSI has had a hand in all of these developments, at times to a significant degree, and has been instrumental in fueling the movement. And by PSI, I mean the large coordinated network that makes us who we are today (believe it or not, we’re not just a bunch of capable staff in a hip office in Boston’s South End 🙂 !). We, collectively with all of you, are able to experience this social change because we have built a strong coalition among government officials, businesspeople, environmental activists, academics, and the general public. This change is inevitable. It makes sense. Manufacturers make stuff, so they should be responsible for managing that stuff. But we all benefit from that stuff, so we have roles too. Defining those roles and providing a vision for the End Game is what PSI does well. We know how to involve others, and we know that all stakeholders have important interests, unique technical information, and experience. We have all done a good job at starting new EPR programs. We need to do a better job at recognizing that new programs will always need corrective action. Product stewardship programs are new in the U.S. and globally. We need to learn from our experiences and apply what we’ve learned to make our programs better. Last, my trip to Japan in June to present a summary of the EPR programs in the U.S. to 130 global EPR experts at the Organization of Economic Cooperation and Development (OECD) was eye-opening, and a great privilege. I came away with an understanding that all of us—those in developed as well as developing nations—hold the pieces to a giant waste management puzzle. But we are not always connected. For example, while some in the U.S. want to ban the export of scrap electronics, government officials in India, China, and Malaysia want to build capacity through education and training to move the informal recycling sectors in their countries to healthy formal sectors – keeping desperately needed jobs. These are two pieces to the puzzle – our e-scrap and their recyclers – that so far have not been adequately connected. I hope that you all get a chance to kick back a bit this summer, recharge, and reconnect to the people and things you love. Rest assured that, somewhere in our vast EPR network, there is the hum of activity, advancement, and accomplishment. This engine of product stewardship will never rest. But you should. Product Stewardship: Times Have Changed in the U.S.A.
For those of us in the environmental movement, it might seem as if we are on a long hike, which keeps going and going and going, from peak to peak, and valley to valley. The landscape looks familiar, the challenges commonplace. There are times to rest, and times to move, times to seek shelter, and times to book it across wide open fields. And then there are times when you sit back and notice that you have come a long way, and that the process was enjoyable, and that the long days of trudging in mud got you to a place of beauty, and that the view is nothing like you could have imagined. One after the other, speakers walked to the makeshift podium at the corner of the paint store, amidst the colored strips of lavender and mauve, and praised the new paint program and its ability to save resources, save money, and create jobs. There was a good feeling, and rolling out right in front of me, like a video documentary, was a paradigm shift of immense proportions, as Important People, from the Governor and his Administration, to key legislators, retailers, and paint manufacturers, praised the collaborative nature of this innovative program. 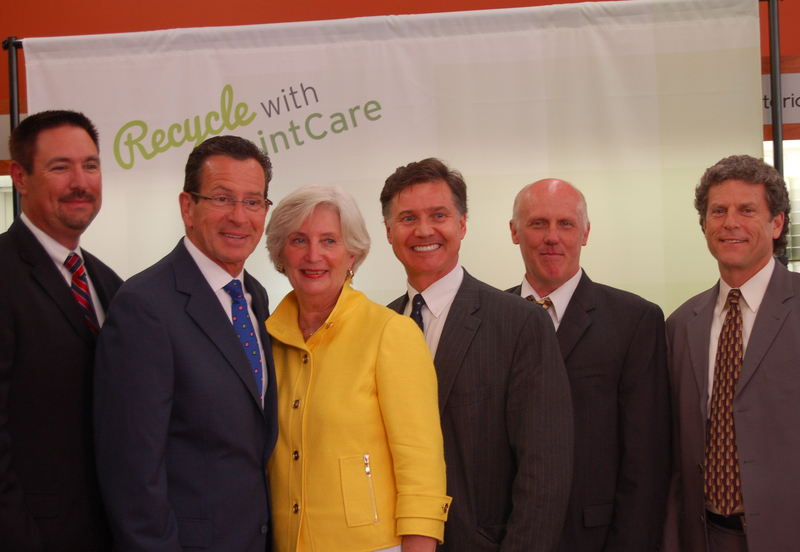 As I stood there listening, it struck me that product stewardship has become commonplace in Connecticut. 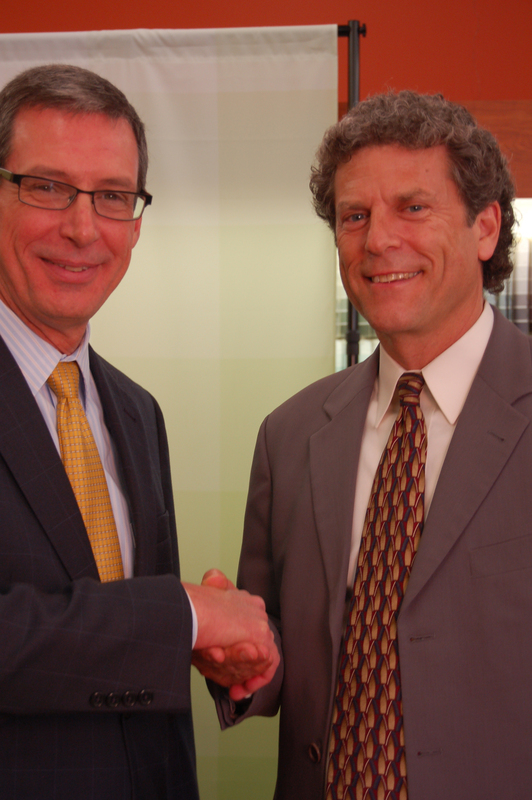 PSI laid the groundwork for paint product stewardship in Connecticut and across the nation by convening paint manufacturers, retailers, state and local governments, and others in national meetings to hash out the agreements that led to this very moment. 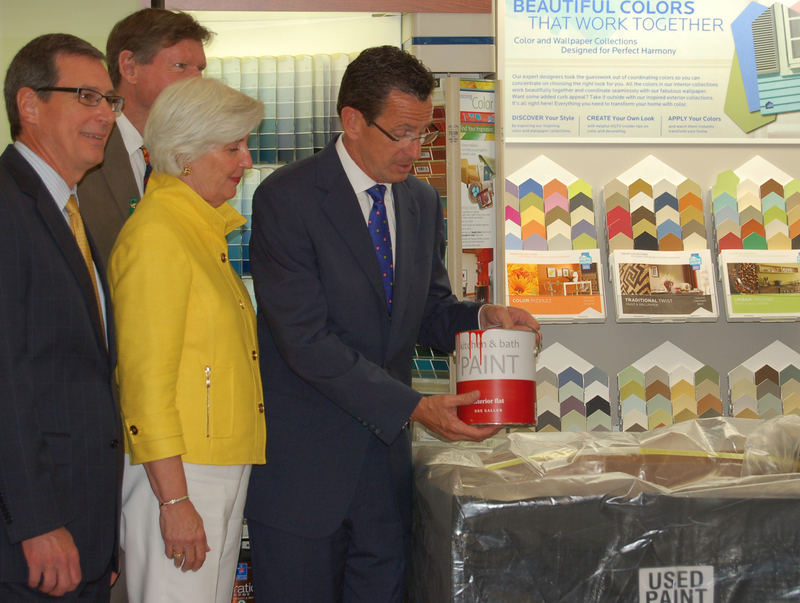 But the paint program in Connecticut would not have happened if each of the local stakeholders at that press event did not seize on the opportunity they were presented. The paint industry has now transformed itself from an industry that once saw consumers as the reason for leftover paint to one that has taken a leadership role to make sure leftover paint is recycled. As our nation debates immigration reform, marriage equality, and voting rights, we can all sense shifts in public opinion that represent sea changes of immense proportion. This year marks a watershed moment in the product stewardship movement. To date, eight producer responsibility laws have passed this past year on four products in eight states: pharmaceuticals (Alameda County, CA; King County, WA); paint (Maine, Minnesota, and Vermont); mattresses (Connecticut and Rhode Island); and thermostats (New York). No, the entire country has not embraced producer responsibility; that will take decades. But we now have Governors and Commissioners speaking about an industry’s responsibility to manage its own waste, and an industry speaking glowingly about its partnership with regulatory agencies that allow it to assume its rightful responsibility. This is the paradigm shift that many of us predicted in 2000 when the Product Stewardship Institute was created on that cold December day in Boston when over 100 government officials assembled to talk about a little known concept called product stewardship. The times have changed. Sometimes it is nice to sit back and enjoy the show, and revel in the enjoyment that your hard work has provided to others. For many of us, now is that time. 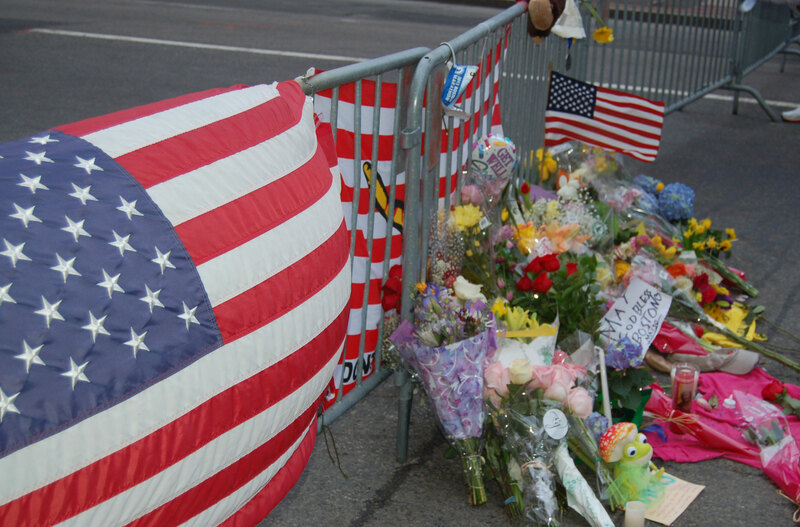 American flags and bouquets adorn the street barricade at the intersection of Berkeley and Boylston Streets in Boston’s Back Bay community. At 2:50 p.m. Eastern Time on Monday, as marathon runners were approaching the finish line and their fans cheered them on, a staff member and I were racing against the clock to submit testimony in support of battery EPR legislation in California. Earlier that morning, I had come downtown on the trolley to work in our office near Copley Square, and had planned to head out for a few hours during the day to enjoy the marathon. In my 28 years in Boston, I had never been to the finish line, choosing instead to stay with my wife and neighbors at mile 23, cheering on the blur of athletes along with the masses. With my wife traveling on business this year, I was hoping for a different experience. But deadlines and unexpected requests came rolling in, and I got absorbed in work. Deadline: 3:30 p.m..
One of the staff heard the blasts, just a few blocks away, in Copley Square. Looking out my window, people walked casually down the alley, no sign of mayhem or even concern. Was there damage? 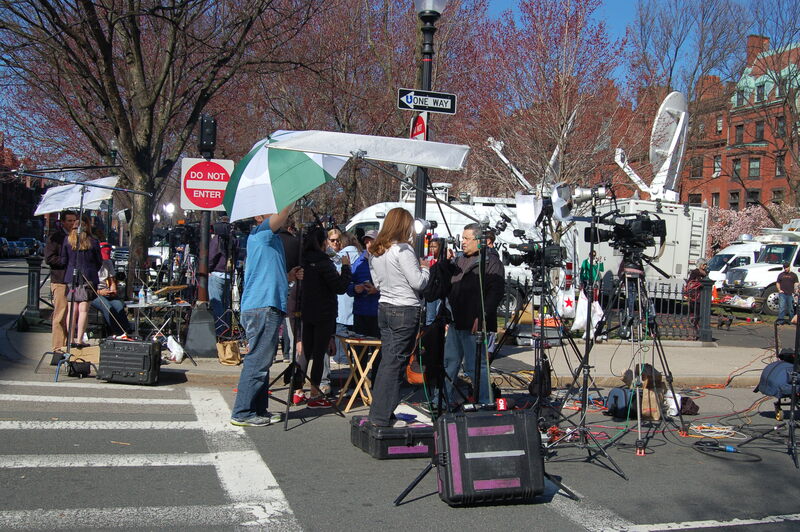 The Boston Commons became the site of a media frenzy in the hours following the bombing. Then we glued to the news. Three of us were in the office that day. One was on vacation, three were working from home, and one had taken the day off to watch the marathon, in person, downtown, in the crowd. Did anyone hear from Mike!? Flashback to September 11, 2001. I boarded an airplane at Logan Airport in Boston at 8:00 a.m. destined for Los Angeles, with a stop in Minneapolis. I was en route to a National Electronics Product Stewardship Initiative meeting in Minneapolis when the pilot entered my airspace to say that our plane was asked to land in northern Michigan. He was calm. I thought we had a technical malfunction. When the plane landed and all the passengers were taken into the terminal, the rows of TVs showed buildings crumbling and on fire. These same electronics that were to be the subject of our recycling meeting were now the transmitter of a new era. Another plane leaving Logan Airport at 8:00 a.m. destined for Los Angeles was boarded by terrorists and never landed safely. It became someone’s weapon of that new era. 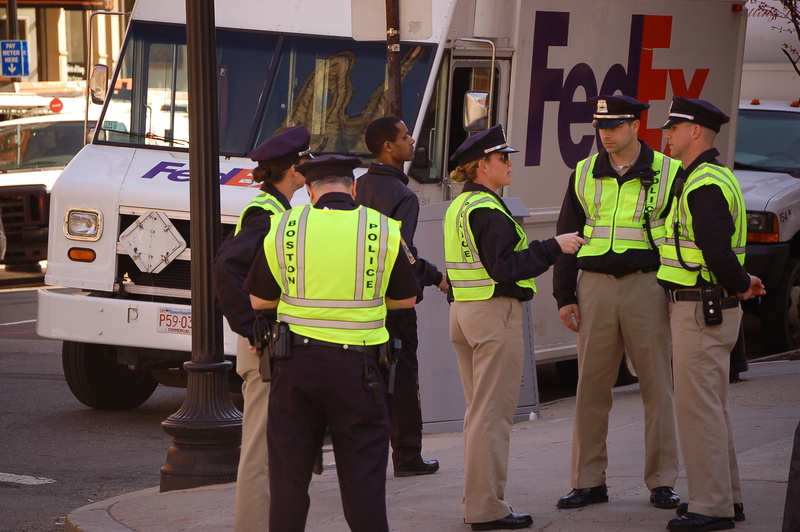 Boston police line the city streets in the wake of the tragedy. Fast-forward to Monday, April 15, 2013. That evening, I walked halfway home, the trains not running downtown, my normal route home diverted by thousands of police. I felt like the pulsating blue dot on my iPad’s GPS – the one on the map that starts out surrounded by a wide circle but slowly zeroes in on my location – and I suddenly realized: Boston is now an epicenter of terror. I went through neighborhoods I did not know, places I had not seen, as streams of ambulances whisked past, lights flashing, sirens blaring, at every corner, for blocks and blocks, yellow tape fluttering, neon vests bobbing, people fighting for their lives, a city mobilized in goodness and prayer. Copters overhead fttt fttt fttt in the cool, clear air. Red lights. Blue lights. Flashing, blurring. I spotted a trolley as it emerged from the depths at St. Mary’s street, hopped aboard, paid my fare, and was transported outbound, where my TV would tell me the story that my heart already knew. 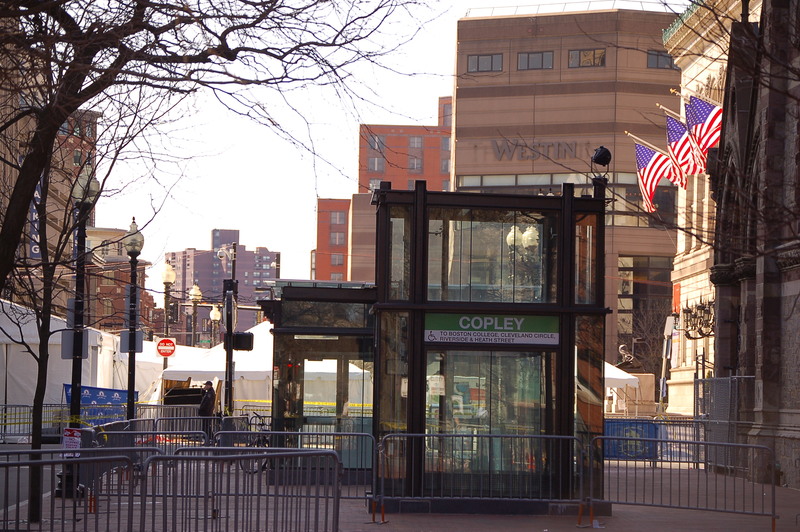 The Copley Square T Station on Boylston Street in Boston, typically abuzz with city life, is now surrounded by barricades and desolate, closed to the public after the bombings. Today, my train stop at Copley Square in downtown Boston is still closed. The underground station stop from which I surface every morning on my way to work, and into which I descend every evening on my way back home, suddenly seems claustrophobic, a trap. The street and sidewalk are now a crime scene, stained red with sorrow. The mundane is now a blessing, screaming for mercy. Boston is sad. Our hearts and prayers go out to the victims and their families. An area brimming with bustle has been transformed into a desolate zone sectioned off with cold metal barriers. The sadness is tinged with disbelief. Someone took a beautiful event – where children hand out orange slices and cups of water to toiling runners – and tarnished it forever. 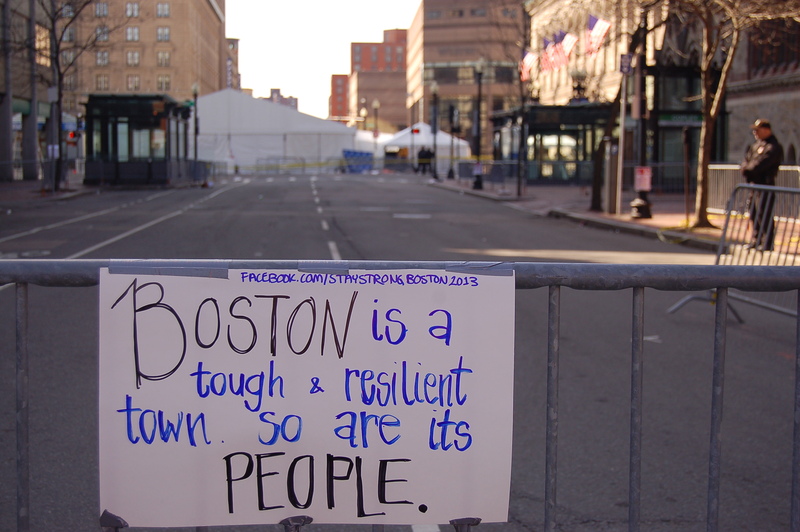 But Boston is also compassionate and tough. The instantaneous reactions of people who ripped off their shirts to help the wounded, or who fearlessly rushed toward the blasts to help save lives, has shown that we live in a great society. These acts of heroism were not calculated movements. They were reactions of people who grew up learning to be kind to one another and to help others in need. A handwritten poster hangs from a street barricade near Copley Square. The memorials of teddy bears, flowers, and signs, and the spontaneous singing to sooth the circumstances, have all come from the innermost part of our collective soul. The mobilization that followed this tragedy has provided us all with a great beacon of hope that now permeates the downtown devastation. Over the past few days, I have received an outpouring of heartfelt support from my family, friends, and colleagues, who let me know that they care – about me and my family, about our staff, about Boston, and about what happened at Copley Square. Who Pays for Product Stewardship? Below is a blog post by Scott Cassel, Executive Director of the Product Stewardship Institute, in preparation for the PSI Networking Webinar, “Who Pays for EPR? Producers, Consumer Fees, Taxes, and Political Perceptions,” on Wednesday, May 18th (1:00-2:30 p.m. EST). Please join us for the dialogue. Ever since being introduced to this phrase, I have found myself repeating it when I want to make a point about not getting something for nothing. Advertisements that promote free vacations and free stuff always come with a hitch…like grabbing your email address for endless promotions, or fine print on forms that sign you up for costs when an initial free promotion runs out. You know the deal. So why do some people want a free lunch when it comes to the environment? These people don’t want their taxes to go up, and they don’t want to pay more for a product at the store, yet they want a clean environment. Why is that? Here is my understanding. Most people really do want a clean environment. And they want to leave clean air, clean water, healthy land, and lots of other stuff to their kids and grand kids. Unfortunately, no one told them about the true costs for these benefits and, even if they knew those costs, they would need to be convinced that the money they paid was used efficiently and effectively. But here’s the kicker – none of us really knows the true costs of the products we are consuming at a record pace. That beautiful silver cup in your cupboard came from mined materials that have their own impacts on worker safety and health and the environment. That hand-crafted wooden crib for the new baby came from lumber that was certified by some organization whose stamp of approval states that the trees from which it came were harvested with great care. And the jeans you just bought are made from cotton grown somewhere under conditions that required a lot of resources, then dyed with who knows what type of chemicals that were treated in some way that was hopefully protective of the environment and worker safety, and did not use child labor. Wow! Is it no wonder that we bury our heads in the sand and move on with our lives… making a living, fixing dinner, creating a home, and staying out of debt. And when it comes to paying for the stuff we use, we all want it for the cheapest price. Remember the credit card bubble, the real estate bubble, and the housing bubble? We are now in the environmental bubble. The real truth is that most of us really don’t have a clue about the environmental and social impacts caused by the products we buy. But we are about to find out, and then we will have burst yet another unsustainable bubble. Let me pose a hypothetical question. What if you knew that Product A had a negative impact on the water that you and I dearly value, while Product B did not? And what if Product B cost only a few cents more than Product A? Like most people, you would probably choose Product B. Now what if Product B was more than a little bit more expensive than Product A? Would you choose it anyway? Fewer people would. They will look harder at the trade-off, and wonder whether the negative impact from Product A was really that much worse than Product B. And how would they really know? Who really knows how either Product A or Product B was made? Even if we had some idea, we are all not scientists who can stop in our tracks and calculate the impacts of every purchasing decision we make. And what if Product A performed a lot better than Product B, or you didn’t want to risk the switch and find out? What would you do then? It’s no wonder that we don’t want to wrap our brains around the full cost of producing the goods we consume. We’d go nuts! Many companies have begun expensive and time-consuming lifecycle assessments to better understand the environmental impacts of their products all along their lifecycle, from mining, to manufacture, to use, and finally disposal. These tools have advanced our understanding of product impacts. But progress has been slow, and these assessments are often best when comparing one variable against another. Taking this information to the public so they can make purchasing decisions is still years away. Pass product stewardship laws of course! Product stewardship systems hold manufacturers responsible for reducing the impacts of their products. These systems provide a financial incentive for companies to design products so that they use fewer and less toxic materials and choose materials that have a market value and can be processed and re-sold after use. Product stewardship acknowledges that there are no free lunches. There is a cost to the environment when we make and use products, and there is a cost to minimize those impacts. If we want clean water and air, green jobs, and lower costs to government, the consumer will pay more than what they pay now for many products. While toner cartridges and lead acid car batteries have a value at “end-of-life” that exceeds the cost of collection and processing, carpet, paint, compact fluorescent lamps, most electronics, and many other products don’t. The product stewardship movement has begun to reverse these external costs on the environment. We all know that the consumer will pay at the end of the day…because there is no such thing as a free lunch…and manufacturers cannot be expected to eat the extra cost. But what if the manufacturer of Product A and the manufacturer of Product B were both required to set up systems to ensure that their products were collected and properly managed when consumers no longer wanted them? And what if these two companies truly included all the lifecycle costs of making and using their products? Only then will you have the real choice between products, since the societal cost of making that product will be included in the price you pay. But how much will you be willing to pay, and for what level of environmental and social benefit? How will you know that the impacts of making that product were truly incorporated in what you paid? And what value do you place on those benefits as compared to your neighbor? This is the bulls-eye for the debate on product stewardship. Product Stewardship Institute: What is the #1 product stewardship issue that needs to be addressed? Jennifer Sweatt: First would be getting the word out about what product stewardship is, I didn’t know about it until I came to PSI. Next would be packaging, I see so much waste in packaging and it drives me crazy. PSI: What brought you to the environmental movement? PSI: Who was your greatest influence? I have had 3 major influences; my dad, a college professor, and my last boss. JS: My dad has always been my mentor and I have tried to emulate him in many ways, my college professor taught me how to think and write, and my last boss taught me so much about business, how best to mange organizations, and how to handle myself professionally. PSI: What could the environmental movement do better? JS: I don’t necessarily think we need to keep telling people the world is in an environmental crisis, almost everyone knows that and those that don’t well…. I think what we need to do more of is letting people know what they can do personally, beyond putting paper, cans, and plastics in the recycling bucket. Within a few months of being at PSI I came across so many ways I could do things differently or better and although some are more than many people may want or be able to do, others are easily incorporated into daily life. PSI: What is the environmental movement doing right? JS: I see the movement turning from the traditional “hippie” stereotype to becoming a part of people’s everyday lives. For kids today recycling has always been a part of their lives and they are more open to what changes need to be made and are more mindful of their personal impact. PSI: On a scale of 1 to 10, with 1 being not at all and a 10 being zero waste, how good a recycler are you? JS: Probably a 6, maybe a 7. We recycle everything we can. We have a compost pile and take larger items to the town compost area. We do look at packaging when purchasing items, and have used it as a decision factor. We try and capture some of our gray water to water our plants with and we try and buy things that can be reused versus one-time use, and have done a fairly decent job of not using plastic bags. PSI: What is the 1 gadget from “the future” you’d like to see in real life? JS: There are so many: tractor beams, light sabers, medical scanners, holograms, but realistically I would like to see a good, reliable, plentiful, cost efficient source of energy that we can use world-wide. PSI: What 1 thing do you do better than anyone else you know? JS: I am not sure I do anything better than anyone else, just as good maybe. Although I do make a mean lasagna. PSI: What would be the title of your autobiography? PSI: What would you be if you could be anything else? PSI: What wouldn’t you want to be? PSI: What is your proudest accomplishment? JS: I’m not sure I have one pinnacle moment yet. I am proud that my husband and I had our own business for a while, that we did take that chance. But, if I had to choose it would probably be my pets – we’ve adopted 3 cats and 2 dogs over the years and all were rescues. It kills me to think someone didn’t want them, because they are so great and bring me such joy. Jennifer Sweatt is the Business Manager for the Product Stewardship Institute. She has over 15 years of experience in finance, administration and in managing small to medium-sized businesses. She was the co-founder of AICS, a local Internet access company in the mid to late 1990’s, and has also worked in the hardware engineering and medical devices industries. She has spent countless hours volunteering for organizations such as Habitat for Humanity and her local library, and is a proud Big Sister with Big Brothers Big Sisters. She is an avid reader and enjoys spending time on the seacoast and walking her dogs. She received her MBA from Norwich University and her undergraduate degree from Bentley College.